There aren't any spots being warmed for players who are currently outside the team, according to Australia captain Aaron Finch. He was responding to a query on David Warner's possible return ahead of the World Cup. 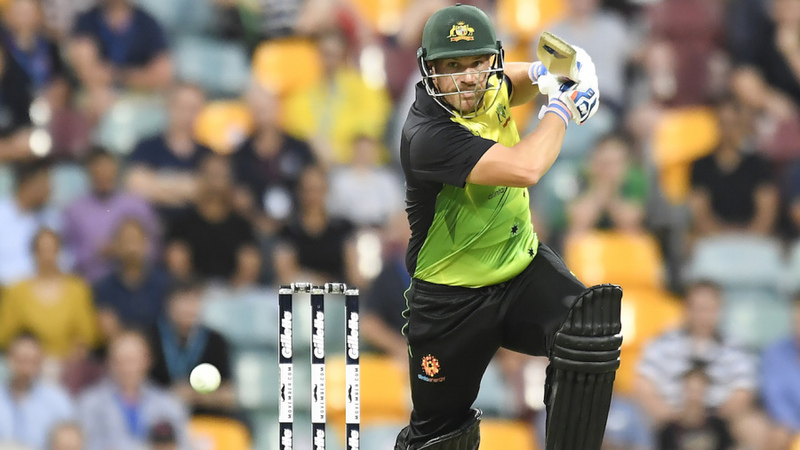 Looking at the larger picture, Finch believes the limited-overs series in India and the ODIs against Pakistan in UAE would give opportunities for contenders to challenge for the opening spot. Australia currently have at least five options on this tour, including Finch himself. "There's a few options we've got," Finch said on the eve of the first T20I in Visakhapatnam. "Obviously myself and D'Arcy (Short). Usman (Khawaja). (Marcus) Stoinis who's done really well through the Big Bash. (Alex) Carey did it really well in the UAE for that last game that we played. Yeah, there's plenty to think about and a few options we can go with, and a few combinations. That's something we'll think about in the next few hours." Finch and the three names he mentioned had long batting stints at the nets. Finch also stated team selection will be influenced by dynamics, not reputation. "There's a great opportunity for guys to come and really challenge for that spot," he said. "We're seeing Davey [Warner] have some elbow surgery recently, and Steve [Smith], so [important] for that to be in the back of your mind as well. If things don't go 100 percent right with the rehab or they have some complications with it and they're not back in time, it's a huge opportunity for guys to step up and almost cement their place going forward for the next little while. "But there's also things you can juggle around in one-day cricket. I've batted in the middle-order quite a bit. Davey's done it the odd time. So whatever we feel is the right combination at the time. I don't think anything's out of the question." Aside from numerous off-field controversies in 2018, Australia endured lacklustre returns in limited-overs cricket. While they won 10 out of 19 T20IS, including a drawn series against India in November, they managed only two wins in 13 ODIs. They then led the ODI series 1-0 before losing 1-2 to India last month. However, Finch said there were improvements in that series and the objective on this tour is to keep that momentum going. "I think it's a great opportunity for us to keep improving," he said. "I think in the series at home, against India, we improved a lot from the series before. There was a great progression made in where we want to be going over the next few months in particular, so it's a great opportunity for us to keep nailing down that pattern that we want to play leading into the World Cup. "We've still got 10 [ODI] internationals plus five other warm-up games before that first World Cup game, so there's still a fair bit of cricket to go. As long as we keep tracking in the right direction and give India a really good fight and win this series - that'll be what it's all about." Finch further emphasised the importance of settling down on a style of play and backing it longer than they have been in the past. For context, Australia used 23 players in 19 T20Is last year and a remarkable 25 players in 13 ODIs. "[When] you lose, you lose confidence in that style. So I think it's really important to make sure you're matching up what is performance-related and what is actually on the right track. If you work back from where you want to be, you can plan it out a little bit easier and understand the guys aren't always going to have their best day everyday - it still might be the right style to play but it didn't come off that day. "So to be a 100 percent committed to that is really important and something that we've got to be mindful of. It's about making sure we're committed and take the ups and down on the way because if we get it right, we're as good as any in the world and we can beat anyone." While laying down a style and sticking with it can take some effort, and time, Australia have the good fortune of coming into a difficult tour on the back of a - somewhat contentiously - long T20 season. The Big Bash League, for the first time, was played in a format that had each team play 14 group stage games, like the IPL, and Finch said the team was particularly happy that the long tournament ended so close to a major international tour. "I think it's a good opportunity for the guys to continue on that good form. Everyone who's here has played a significant role in their BBL franchises on in the Test series just completed. So I think it's a good opportunity to play some T20 cricket, especially against India who are quality in their own conditions and , well, everywhere, to be fair; but after having a really good stint of T20 cricket. It's not often that we get a chance to have a tournament lead into an international game. He also indicated that the extra length of the BBL - a point of contention for many - might not have been the most terrible thing. "The schedule that the Big Bash allowed, especially the second half of the tournament, there was a lot of time between games - I think that's as good as a freshening up as you get in the modern game. I know our franchise, the Renegades, was a relaxed environment. There wasn't a huge amount of meetings, there wasn't dramatic commitments for guys outside of training and playing. So there was a chance for them to be able to freshen up and really just focus, rather than having to worry about the extra stuff that comes along with playing at the highest level. "So I think guys like myself and Pete, Maxi, would have got a lot of time to freshen up during that period. And there was a lot of time spent at home as well, which was nice. After this and after the UAE series, most guys have got April off, which would be a great chance for them to freshen up and recharge and go again for what is going to be a huge six or seven months for Australian cricket."